This was a weekday in the heat of summer, but there were plenty of tourists. The Christians used these caves as churches and a monastery. A happy Michelle enjoying the museum. View from the outdoor museum back towards Goreme. There was a nice church up some stairs. May have been a kitchen and dining area. Small entries to protect again intruders and bad weather. Notice the caves in the background. After we left the Open Air Museum I climbed to the top of a peak. Yes, it is hot and that is sweat. Michelle chose to wait down below for me. A French guy took my picture. Midnight at the oasis. Well, it wasn't exactly midnight, but this fresh squeezed juice and comfy, shady seating felt like an oasis while hiking in the Red Valley. Michelle enjoys a break while the orange juice is being prepared. Many tunnels along the way. Everywhere you look are gorgeous views. Here's one of the four churches that we found in Rose and Red Valleys. Actually, we didn't go up this entrance, but found a side entrance. We hiked for about 7 hours total, but it was pretty green and had some shade along the way. This church looked more like a traditional church than some of them. A German guy who we hiked with for a little while. Interesting rock formations caused by a volcanic eruption millions of years ago. We got lucky. We only ran into a few scooters and ATVs, and not until we left the valley. Another family who hiked in Rose Valley complained that there were many ATVs. Back in Goreme, we passed a cemetery near our Kismet Cave House. 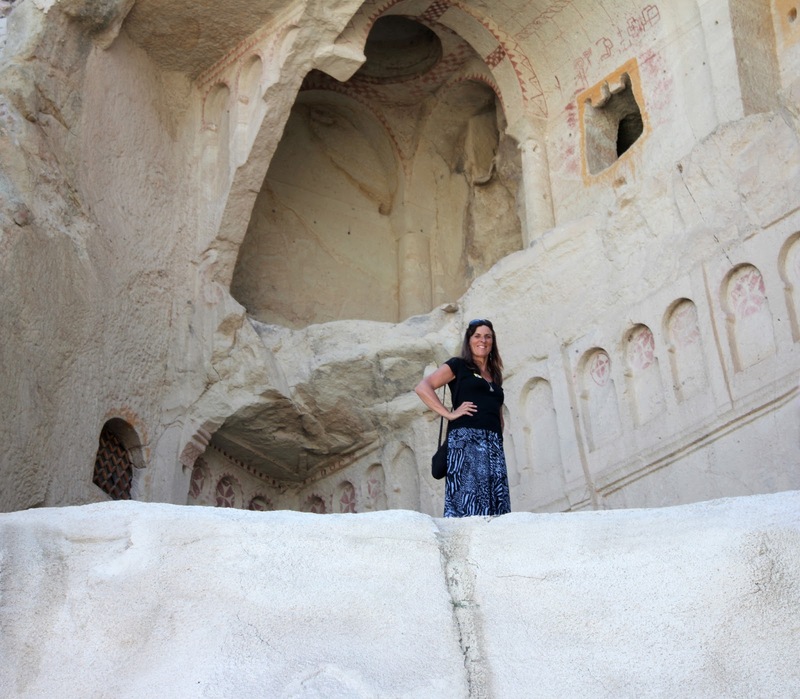 Our hotel, Kismet Cave House in Goreme. Happy to be back after 7 hours of hiking in the sun.